Should we allow natural gas drilling within a few miles of some of the West’s most iconic national parks? This is one of the many questions the current administration is wrestling with, inheriting a legacy of what many Western citizens – Democrats and Republicans alike – consider to be years of unbalanced, pro-industry decisions and regulations by federal land management agencies. 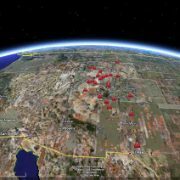 SkyTruth has produced a gallery of images showing the locations of 77 leases for natural gas and oil drilling, on public land in Utah, that were auctioned off to the oil and gas industry by the Bureau of Land Management in December 2008. These leases were suspended by the federal government in February 2009 pending further review by the Department of the Interior, after receiving over 1,600 complaints from environmental groups, the Outdoor Industry Association, sportsmen organizations, and a collection of river runners, guides, and outfitters. 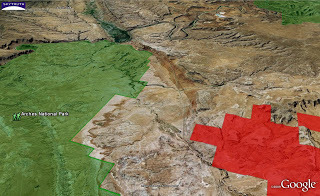 Several of the leases are adjacent to, or within a few miles of, Dinosaur National Monument, Canyonlands National Park, and Arches National Park. 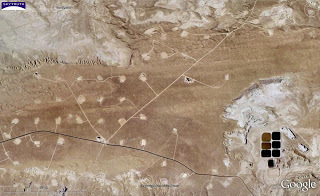 We’ve included a few images showing current drilling operations in nearby parts of the Uinta Basin, to give you an idea of how severely the suspended areas could be altered if Interior decides to go ahead and approve the leases. 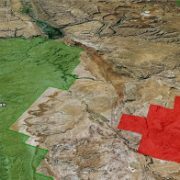 Get more background info on drilling in Utah, and keep up with the latest on this issue, at the Southern Utah Wilderness Alliance website. Because this fight isn’t over yet — some of these leases may get reinstated. We’ve been having fun with the MyMaps application in Google Maps. Anyone can build their own custom maps and publish them online. This is really useful and kind of fun if you’re a map-geek like me. 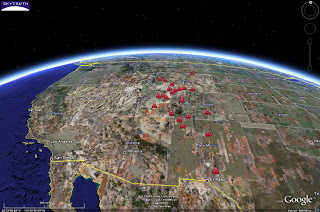 We just created a map of the Rocky Mountain states (CO, MT, NM, UT, WY) showing some of the places where conflict has emerged recently because of the rapid pace of drilling, mostly for natural gas. This is not just about tree-huggers; many of these conflicts involve local landowners, ranchers, hunters, outfitters and ordinary folks who are angry about the impacts to the land and wildlife, pollution of once-pristine Western air and water, and decline in their quality of life. So check out the map. And if you get inspired to create your own map that tells an environmental story, please share it with us: add a comment to this post, or send us an email. By the way, our interactive conflicts map is featured on a new website, Why The Favors (WTF?? ), making its debut this week at the Democratic National Convention in Denver.